Good morning, brothers and sisters. Happy God's Day. I want to share with you much of the inspiration and internal guidance that Father gave us before he went back to Korea. The title of my talk is the subtitle of Father's motto, Ne Nara Tong-il. All during 1989 Father said very clearly that we are now a new people with a new mission, not to wander, not simply to pay indemnity, but rather together with our True Parents to go into Canaan and to take possession of all things back for God. When Joshua went into Canaan, he spoke to the people, "... Be strong and of good courage; be not frightened, neither be dismayed; for the Lord your God is with you wherever you go. "(Joshua 1:9) He warned the people to stay true to God's word and tradition, to meditate on it day and night and teach it to their children, for if they strayed, they would not prosper. But if they kept God's commandments, they would prosper and possess the land. In his midnight speech, that is exactly what Father is telling us also. If we will live according to the Principle and True Parents' vertical tradition, we will prosper, even though we are a small handful of people going into the entire world. Then Joshua says, "Remember the word which Moses the servant of the Lord commanded you, saying, The Lord your God is providing you a place of rest, and will give you this land. -- (Joshua 1:13-15) Sounds comforting, doesn't it? But he goes on to say, "Your wives, your little ones, and your cattle shall remain in the land which Moses gave you beyond the Jordan, but all the men of valor among you shall pass over armed before your brethren and shall help them, until the Lord gives rest to your brethren as well as to you, and they also take possession of the land which the Lord your God is giving them; then you shall return to the land of your possession, and shall possess it, the land which Moses the servant of the Lord gave you beyond the Jordan toward the sunrise." Actually, it would not just be handed to them. They were not to just settle contentedly on the outskirts of Canaan, but were to actively take possession of the land. On that foundation God could give them the nation and all things. God's original intention was to multiply His own lineage of people who would love Him as He loved them. Yet because of the fall, a lineage of hell multiplied centered on Satan's self-centered "love." All throughout history God has been trying to take back His family, clan, and nation through the individuals who succeeded in making a foundation of faith and substance, beginning with Jacob and his tribe. His will. They fell into faithlessness over and over again until finally they were invaded, and the people of God were scattered across the earth. Christianity, the second Israel, in its 2000-year history, has created the spiritual level foundation on a national level, waiting for the Second Coming. We, the third Israel, are the chosen people asked at this moment of history to go out and claim God's nation. We stand not just on a foundation of prophets or the Messiah who has been killed. We stand on the foundation of True Parents, the King of kings, the Queen of queens, the royal family. Father has been preparing for this moment all his life. At a leaders' meeting he said, "Do you know what I prayed for when I was in prison in North Korea? And when I was in Pusan, when only a few members were around me? I didn't pray for anything else except God's nation." Every moment that he fought and prayed, everything that he sacrificed, everything that he created -- businesses, conferences, seminaries -- every condition he made, was for the purpose of establishing God's nation. He said that in a moment he would sacrifice it all if that would contribute to winning back God's nation. Father told us that we too should prepare our hearts to give up our lives, our families, all of our possessions, to give everything. He said, "Be ready to go wherever I need you, because we need God's nation." Our God's Day gift for our Heavenly Father and our True Parents in 1990, then, is to give them the nation. Father is willing to sacrifice the whole church for God's nation. But to sacrifice for the greater purpose, the larger whole, has always been Father's way. He is teaching us to have that same spirit. But he also told us not to be afraid, saying how much more God will care for us than for the "birds of the air" and "lilies of the field." (Matt. 6:25-33) Once God has His nation, all things will be given to us. But God first has to have His nation, otherwise nothing can really be possessed. As you know, in 1945 Father's original desire was to establish a seven-year course on the Christian foundation to create the worldwide level foundation for the substantiation of God's nation and eventually the Kingdom of Heaven on earth. But since established Christianity did not support him in 1945, Father had to take the position of John the Baptist, just as Jesus had to do. In the next 40 years, Father created with his own hands the foundation that took established Christianity almost 2000 years to create. Like established Christianity, our church has spread worldwide through its mission work; we have business foundations worldwide and involvement with every generation of people and in every aspect of life. Finally in 1985 Father declared that he was beginning the seven-year course that he intended to begin 40 years before. We were to go our own Danbury course and win back America in the first three years. Last year, 1989, was the fourth and transition year of those seven years. Father has said this is now a whole new time and the final three years he will spend primarily in Korea, focusing on China and the Soviet Union. He has laid all the groundwork necessary for us to be able to begin to see the Kingdom of Heaven on earth in this decade. President James Baughman delivers the God's Day sermon to members in New York. Let's look at what Father did in 1989 to prepare for this unprecedented new age. Last January Father told us our church and the world were entering a new time and that we should realize that what used to be daytime is now nighttime and what used to be nighttime is now daytime. If we keep going in the direction we have been all these years, we will find ourselves going in the wrong direction. Then there were the Blessings of Kook Jin Nim, who represents the nation, the 72 second generation couples, and the 1275 couples. Based on that, Father came to the United States in March and gave us the mission to become messiahs on a tribal level. Before we can have the national level there has to be unity on the tribal level. Also last spring Father was working to create unity between Cain and Abel on a global level. At the World Media Conference he spoke to journalists from China and the Soviet Union, as well as the free world. After that, the journalists interviewed Mother with questions about Father and published it in a Soviet newspaper [see Today's World, July 1989 issue]. That was the first of several positive articles published about our True Parents in the Soviet Union. In June the recognition of Father by all the clan leaders of Korea in essence gave True Parents the position to be not just clan leader of all clans, but ultimately to internally be king and queen of the nation. During the summer of 1989 Father spent time fishing as a condition to unify the nations of the world and to restore God's children. On that foundation True Parents asked us to witness and teach in order to substantially bring the people back to God. 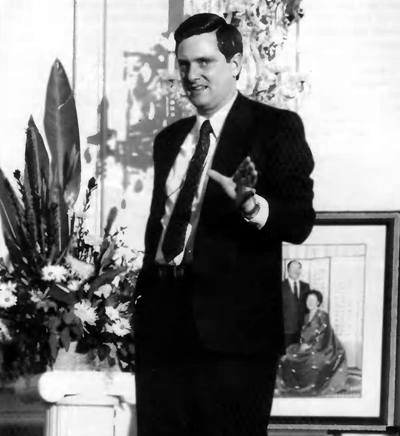 Then in Alaska on August 31, 1989, Father declared the end of the 40-year indemnity course of the Unification Church and the victory of the eight-step foundation or settlement. Next he declared the Age of Parentism, not just for us but for the world. In early October Father celebrated in Korea the first anniversary of the establishment of the Unified World Nation. It is no coincidence that after that, Jericho fell -- the Berlin Wall came down and seven nations of Eastern Europe crumbled and are now trying to build new non-communist governments. Father's concern is that they can have his ideology before they make the same mistakes as many free world countries have made with their licentious use of freedom. All these things are foundations Father and Mother completed in 1989 to be able to stand as the parents of mankind and begin the time when the Cain and Abel struggle dissolves and unity occurs centered on True Parents. But what have we done to prepare for the coming of the Kingdom of Heaven on earth? Did we fulfill as tribal messiahs? How many of us taught lectures or witnessed? How many of us gave our lives for Cain, our brothers and sisters in the streets who are suffering? We have failed in many ways and are now given a mandate to do something about it. Father has told us many times about the eight-step [servant of servants, servant, adopted son, stepson, true son, mother, father, and then divine level -- God] formula course that he went and that we must all follow on every level [individual, family, clan or tribe, society, national, world, and cosmic]. To be a servant of servants, Father said, is to be in a position where nobody defends you. You have absolutely no rights, no dignity -- you are nothing. Even the servants and dogs despise you. This was where Father started as an individual in 1945. Step by step Father went the course on one level, won the blessing, and then offered it up and went back down to the bottom again on a larger level, to the servant of servants position of misery and persecution. He said that every time he was in prison represents a time when he was at this lowest level. But finally Father could proclaim the completion of this course on August 31, 1989, and take the position of King of kings. Judaism and established Christianity never made it to this level, but Father and Mother have, and that is why we are now at the verge of a whole new time. Imagine how joyful Father feels to be so close to accomplishing this for God after all the years of struggle and strife. And he wants us to be a part of it. This seven-year course ends in 1992, the date he has asked us to work toward. He is telling us that if we simply go the formula course on the individual, family, and tribal levels, willing to sacrifice everything, we can inherit this entire condition that he has made for us and begin to see the substantial reality of the Kingdom of Heaven on the earth. This is exciting! 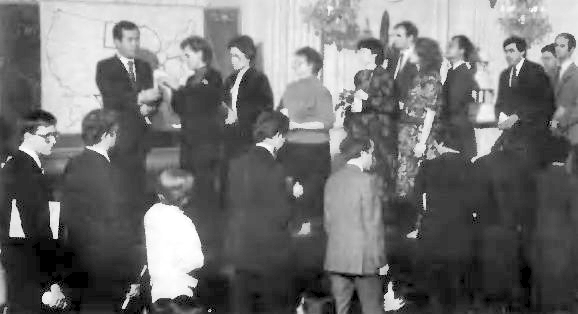 We cannot sit back and say, "Oh, another year in the Unification Church. I am getting a little older. Had another baby this year." It's not just another year. This is a serious and very hopeful time because of what our Father has done in 1989 to gain God's nation. "For a root to become stronger, must it go up or down? It must go down, deeper into the earth. In a storm the leaves and branches may be blown away, but the root is strong. And if it is strong, the tree will survive. The trunk root is the one that goes to the deepest part. The root likes fertilizer, and dark, humid places, whereas the branches and leaves love fresh air and sunshine. So a person is needed now who likes to go down into the dirty part, the worst part of the satanic world, and enjoy the nutritious elements to feed the tree. To establish God's world you must start from the bottom, while the satanic world is at the top. God's world is starting at the bottom." With us now Father intends to plant seeds all across the world. After the 1275 Couple Blessing Father mobilized an international group of people to work on a servant of servants level in Korea and to love that nation. It is our time to go down and to rise up again on a national level for our Heavenly Father and True Parents. But have we fulfilled this mission to go all the way down and give up everything that we have in order to claim the nation? To do that we must sacrifice all that we are and have. Are we ready to be planted? When I was in Japan in October, I saw more clearly what we can leer n from other cultures. In Japan is a very strong vertical tradition of reverence to the emperor. That is why Japan can be so successful. In Korea, however, that vertical tradition is not just centered on the king or emperor, but rather centers on the parents, and thus is closer to God's tradition. In America, our heritage was founded on a rejection of the king and the royal family. But as a result any kind of vertical tradition has dissipated to egalitarianism, to the point where President Reagan was addressed as, "Hey, Ronnie," and some children may call their parents by their first names. Because every race, nation, and religion are represented in America, we stand in a potential position to represent the unified world culture centered on God, yet Father cannot use us as we are because we come from a tradition that is also tainted with these other things. God intended to bring the Messiah during the time of Kings David, Saul, and Solomon, and again at the time of Charlemagne. If the king were righteous and God-centered, then the Messiah could come and unite with him. All the people would follow automatically because of the reverence to the king, and God's nation would be created. But if the king is unrighteous and not God-centered, then God has to use another method -- democracy -- which takes much longer and more effort because the Messiah has to win each individual rather than just the king. We rejected the king 200 years ago in America so that we could have religious freedom, but now we are so caught up in individual self-determination and egalitarianism that we have forgotten what it means to connect with the righteous king, God's king. In America we have often rejected the Korean and Japanese members for all sorts of critical reasons, not understanding that through them Father was teaching us the tradition of uniting with the true royal family. Before God and Father can work through the American people to create the unified world culture, we must first have the vertical root and have that tradition implanted within us. Our destiny is not democracy as we now have, but a vertical kind of democracy guided by Headwing ideology, living as a family with a connection to the True Parents. We must learn quickly from our Korean and Japanese leaders in order to unite with the new royalty and establish the unified world culture with our True Parents. Before Father left for Korea, he said, "Now is the time for you to prove yourselves. Have you learned the tradition? Are you ready to go beyond into the other nations of the world?" He laid out clearly a very important plan: First of all, in order for God to work the foundation of substance must be established. CARP as the younger with the enthusiasm and the second generation spirit, and the Church as the older with the root and the tradition, must unite so that the youth's energy will not dissipate and be lost, but be rooted in the tradition. Their unity forms a larger Abel to unite with the rest of our movement. Then our movement should unite with established Christianity to create an Abel to unite with the rest of America and those together form a larger Abel to unite with the Cain free world. With that unity, we create an even larger Abel to unite with the communist world, ultimately bringing about Cain and Abel unity on every level. Father said if we want God to be able to work in America in 1990 to save both Christianity and this nation, we must make this unity. Father says to be Abel; we must become servants of servants, go down and be planted, deepen our roots, and rise up in True Parents' tradition and save Christianity. This is the purpose of going through the IOWC. So what does that mean? We've got to sacrifice something. All of us have gained a lot of things over the last years in the Church. What was the first thing you did when you joined the Church? You gave up your home, your possessions, all your identity, and you followed this way, working in very humble circumstances. Because we sacrificed, we gained friends, a family, and many other things that you realize came not through your own effort but because you died to yourself. You proved that if you give your life, you will gain it. But we receive those things so that we can sacrifice them again for the next level. Father and Mother are still sacrificing their family, comfort, sleep, many things. Is it time for us to say, "Okay, I did my job, I sacrificed, I paid my dues. I went the seven -year formula course. I can now settle back and calmly do my mission"? What we have received and achieved is not our own. You may think, "Look how many people or how much money I brought into the Church." At our leaders' meeting Father said, "Whenever you achieve something, forget about it. Don't ever think that it was because of you. God was able to use you because of your faith, your sacrifice, and your willingness to cut off from everything, and go this way. But as soon as you start to say, 'Oh, look what I did,' at that point you choke it off. You have to be able to say, 'Thank you, Heavenly Father, for doing all this through me. And now I give it all away. I will start again at the bottom, just as Father did." This is our challenge. It is a very difficult thing to do, right? You can imagine what it was like for the Israelites to come to the River Jordan, and not have to eat that manna and quail or taste the grit of sand in their mouth anymore after 40 years. They could set up their tents, have fresh water, and care for their livestock. Wasn't that wonderful, just to be able to rest for a while? Yet, God did not intend them to be content with the Jordan River, but to go on to the next level. That is why He told them to leave their families and take the land piece by piece. Father is also telling us, "You cannot rest yet. The nation is not God's," and until it is, we cannot really be content with what we have. Our gift to Heavenly Father and True Parents on this God's Day is to make a condition for God to claim the nation of Korea by making a condition in America to claim it back for God. So the mandate now is to create an IOWC. 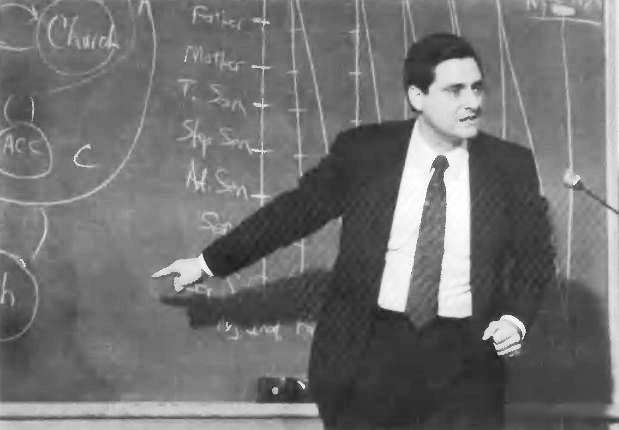 Father has asked us to go out on a Day of Hope tour, 1990, as he did in the early '70s, to 1) make a big noise, 2) gain members, 3) save the second generation, and 4) connect with the Christian foundation in America. We must make conditions of faith and substance to quickly claim back the people and the nation for God. Isn't it shameful that the Soviet press has printed full-page positive articles about our True Parents, and this nation has never done it yet? That the Soviets and the Chinese are begging Father to come there to the World Media Conference, and our nation has not spoken a word? It is time to wake up this nation to an appreciation of our True Parents! And who is going to do it? The mobilization is for all of us, not just for a few people. For the core of the IOWC Father looked at me and said, "You go out and take your people." Headquarters staff, are you determined to go out on IOWC? (Yes) Are you determined to win this nation back and set an example? (Yes) Are you willing to sacrifice everything to go out there? (Yes) The pledge is made. We are going to every state and will reach the entire nation, speaking everywhere we can, before the end of March. Father wants us to unite with established Christianity and to unite the second generation with that foundation. He gave us the motto of our tour: "God's Hope for America: The Return of American Youth to a New Christianity." This is the hope that our True Parents are giving to this nation. "When the Israelites came to Canaan, they had been in the desert a long time, and they were weak and hungry. The people of Canaan were fat and wealthy. But the Israelites completely depended on God. That was how they could win. It's not a question of our numbers but it's a question of how united we are with God. If we are united with God, then we can completely occupy Satan's world." This is the time to go out with faith and to be willing to sacrifice many things. It is not going to be easy. But the sacrifice being asked of us this time is not anything like it was many years ago for the early blessed couples. Father is saying leave your families and do what has to be done to finish by the end of March because he has plans for April. We must prove to Father that all these years he has toiled and sacrificed here are not in vain, that we have learned the tradition, the vertical root, and that we can go out and save this nation. Now there may be many reasons why you can't go, just like the many excuses why people couldn't come to a lecture or join the church. We are coming full circle again, brothers and sisters, though there are much greater things to be gained and lost this time around. But if we make the sacrifice, we will gain great things, and we can offer that to Father on a worldwide level. This is the Day of Hope. When the IOWC comes, don't worry about all the commitments you have and all the things you have to do. Witness and bring your relatives, bring ministers and their congregations, bring your friends, bring scholars, bring everyone to the lectures and the workshops. It is time to educate this nation in the Headwing ideology. Father said the Soviet Union is now facing winter, and you can see the con sequences of it. America is in the autumn period, China in the summer, and Father is in the springtime. To be in the autumn period means winter is coming soon and we need to make this nation strong with the root deep enough to be able to withstand the storm. It is coming, Father said. That is why we must be desperate to save this nation. At the end of March, we must have reached 500 cities. After that, the revival will continue to 2,000 cities, and then to 20,000 cities. The goal is still 30,000 members. We must do it this time. This is our destiny. What is our main mission as a chosen people? What was the mission of the first Israel? To witness. Unfortunately they chopped off heads instead of chopping off traditions. What was the mission of all Christians? To witness. Our mission is to cut off the traditions of Satan and to witness and teach to win God's people and nation. God will do everything He can to fulfill this, His greatest desire. How are you going to help out? Not everybody can get out and witness because of children, but you can take on a little extra load so that somebody else can get out. We need people willing to quit their jobs and to become city leaders and workshop directors. Find someone to replace you in what you are doing so that you'd be responsible, and take your family to go out and be a teacher, as one family did. We need them in every state. Father said the mission of the blessed wives during the revival is to at least make a monetary pledge every month to the region. If you cannot be the teacher or witnesser, then give money so those who are doing it can do it freely. If you don't have a lot of money, pledge ten dollars. But make it hurt a little bit. Let's make the sacrifice. We are all in this together. Even if you cannot go out, you can help in some way. What do you say to people? Teach! Speak the word. We all have a teaching condition these next three months. Mothers, you can teach at home to your babies, even if you have to read word for word out of the Principle book. Some of us have complained so much about the leaders, the church, and the situation that in a way we have distanced ourselves. We say, "Well, I'll give or do something after I see some proof that they will treat me better, or proof that they will use my money more wisely." But Father teaches us to be unconditional. You have to pray for your leaders, trust that they will use your offering wisely and keep giving in every way that you can. Don't leave the church even in your mind. Be a core member. This is no time to retire. We have gained many things because of our True Parents. Now Father is saying, "Offer it all. Go down and you will gain the nation." Do you believe that if you are willing to give your life you will gain it? Do you believe that you are the chosen people and that you can take this nation? Father believes it, and he is telling us, "Do it!" True Mother gave one of Hong Halmonim's (Soon Ae Hong - Dae Mo Nim) prayer candles as a seed candle to be multiplied into prayer candles for church members. After the God's Day sermon in New York, Rev. Joong Hyun Pak offered a prayer to bequeath Hong Halmonim's prayer candle to community leaders. These were then multiplied for New York area members. How do we prepare? First, if there is any impurity within us, get rid of it. Mother asked us to connect with the purity and the determination of Hong Halmonim (Soon Ae Hong Dae Mo Nim) and to use that determination to gain back the nation. In tears she said, "Purify yourselves." Don't compromise with the tradition, as the Israelites did. This is the key to our victory or to our failure. If you drink, don't! If you smoke, don't! Any kind of wrong thinking, don't! Purity. God will use that to give you power and strength. Second, sacrifice. Understand the power and the principle of indemnity and use it for your benefit. We think of indemnity as this burden we have to live with, but Father uses it for his benefit because he knows it will never fail. Be willing to sacrifice. Follow that formula course that Father has gone for 40 years. Third, we have to unite. Unification in our Church is long overdue. I don't care what mission you are doing, who you work for, who your leader is, please remember we are all brothers and sisters under one set of True Parents. The only way we are going to make this IOWC work is through unity. This IOWC will be a good chance for us to work together. Finally, love unconditionally. Don't take pride in what you are or do. Be humble and forgiving. The best way to love is to witness because God needs people. All of these things -- to purify yourself, to sacrifice, to unite, and to love -- must be done in the vertical tradition of our True Parents. Don't be afraid to plant your root deep into the fertilizer, mud, and junk. Again, it's easy for us to say that maybe we've done that enough in our life. But Father has never retired. And until he does, we can't. Don't give up. Father said, "There are three kinds of people in this world: the people who lead history; the people who follow history; and the people who simply observe." There are those three kinds of people in our church too. We have to ask ourselves right now, why did I join this Church? Why did I sacrifice and go through all that I went through? Was it to just simply observe what Father is doing now, or to follow whenever somebody tells me what to do? Or is it now to go out and lead history by witnessing, by becoming a leader and a lecturer? Let's forget all these excuses that have caused us to cop out of our Church and instead become a core member again in 1990. Actually, we've let Father down so many times. Now he is giving us a chance to go out in America again and to witness and make the foundation that we should have made a long time ago to win "my country" for God. That is the gift we give, and you are all a part of it. I invite you to take part in the IOWC in whatever way you can. You may not have a lot, but give out of your need, not out of your surplus as it was with the Pharisees. If we don't, all that we possess will have no meaning. Maybe these are hard words, but now is an exciting time, and it's good to start out deep, firm, planted in substance. From here, the only way is up. Do I have your word and your pledge that you will go this way?